When prices form pictures on charts, you can obtain realistic objectives for later moves. One of the most reliable chart formations is the head-and-shoulders top or bottom. This easily recognizable chart pattern signals a major turn in trend. The main advantage of the head-and-shoulders pattern is it gives you a clear-cut objective of the price move after breaking out of the formation. Measure the price distance between the head and the neckline and add it to the price where the neckline is broken. This projects the minimum objective. Although the head-and-shoulders gives no time projection, it predicts a very strong trend in the future. 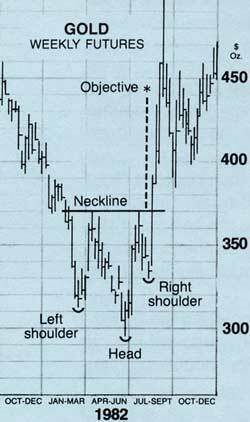 In most cases, a head-and-shoulders formation will be symmetrical, with the left and right shoulders equally developed. Although the neckline doesn't have to be horizontal, the most reliable formations stray only a little. Flags and pennants are consolidation patterns which give objectives for further moves. 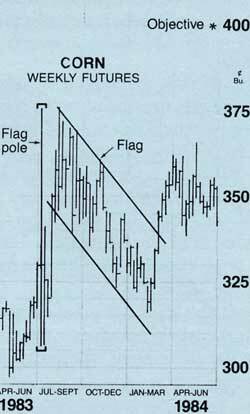 As the formation develops, price action in an uptrending market will look like a flag flying from a flagpole as prices tend to form a parallelogram after a quick, steep upmove. Flags "fly at half-staff." The more vertical the flagpole, the better. A price objective is obtained by measuring the flagpole and adding it to the breakout point of the formation. The flagpole should begin at the point from which it broke away from a previous congestion area, or from important support or resistance lines. Flags in a downtrending market look like they are defying gravity and slant upward. 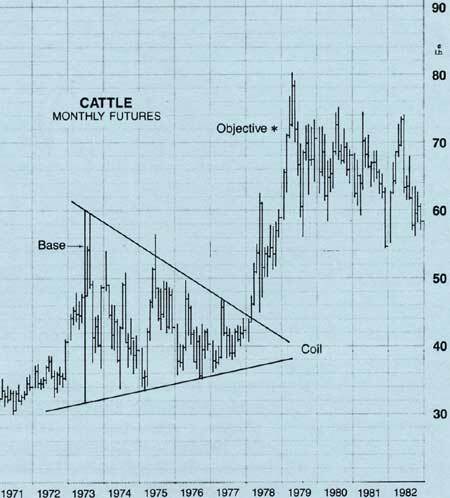 A pennant also starts with a nearly vertical price rise or fall. But, instead of having equal move reactions in the consolidation phase like a flag, pennant reactions gradually decrease to form short uptrend and downtrend lines from the flagpole. The same measuring tools used in flags are used in pennants. Add the length of the flagpole to the breakout point to get the minimum objective. Remember, flags and pennants are usually continuation patterns in an overall trend which resumes after the breakout of the consolidation area. Also, the coil formation, or symmetrical triangle, appears while prices trade in continually narrower ranges, forming uptrend and downtrend lines. This pattern doesn't tell you much about the direction of the next move. After breaking one of the trendlines, the objective is found by adding the width of the coil's base to the breakout point. The formation gets its name from the way prices contract and suddenly spring out of this pattern like a tight coil spring. One caution about this formation: It's best if prices break out of the formation while halfway to three-quarters of the way to the triangle's apex. If prices reach the apex, a strong move in either direction is less likely. Ascending and descending triangles are similar to coils but are much better at predicting the direction prices will take. Prices should break to the flat side of the triangle. Price objectives from ascending and descending triangles can be obtained two ways. The easiest is to add the length of the left side of the triangle to the triangle's flat side. Another method of projecting price is to draw a line parallel to the sloping line from the beginning of the triangle. Expect prices to rise or fall out of the triangle formation until they reach this parallel line. In the lesson on trends, we mentioned double and triple tops and bottoms. These formations also provide us with objectives. Once a double bottom is completed, prices should rise at least as far as the distance from the bottom of the "W" to the breakout point. A double bottom is confirmed when prices close above the center of the "W" formation. This is referred to as the breakout. The difference from the bottom of the formation to the top gives a price objective. Targets for price declines from double tops are figured the same way. Often, prices will retest the breakout point after completing the formation. After a double top is completed, prices may briefly rebound to test the resistance, which is the same point where the original double top was completed.